Chief Joseph (March 3, 1840 – September 21, 1904) was the chief of the Wal-lam-wat-kain (Wallowa) band of Nez Perce Native Americans during General Oliver O. Howard's attempt to forcibly remove his band and the other "non-treaty" Natives to a reservation in Idaho. For his principled resistance to the removal, he became renowned as a humanitarian and peacemaker. He wanted to retain the land of his ancestors, while also hoping to avoid warfare with encroaching whites. He only resorted to conflict when making concessions was no longer a viable option. Chief Joseph would become a mythical figure in the United States, as people attempted to seek out a Native American folk hero with whom they could identify. Until his death, he would put this image of himself to use in an attempt to gain greater privileges for his beloved followers, dedicating a great deal of his time and effort to promoting racial equality and petitioning for land rights. Born Hinmuuttu-yalatlat (alternatively Hinmaton-Yalaktit or Hin-mah-too-yah-lat-kekt, Nez Perce: "Thunder Rolling Down Mountain") in the Wallowa Valley of northeastern Oregon, he was known as Young Joseph during his youth because his father had the same name. While initially hospitable to the region's newcomers, Joseph the Elder grew wary when settlers became greedy for more Native American lands. Tensions grew as the settlers appropriated traditional Indian lands for farming and grazing livestock. Isaac Stevens, governor of the Washington Territory, organized a council to designate separate areas for Natives and settlers in 1855. Joseph the Elder and the other Nez Perce chiefs signed a treaty with the United States, establishing a Nez Perce reservation encompassing 7.7 million acres (31,000 km²) in present-day Idaho, Washington, and Oregon. The 1855 reservation maintained much of the traditional Nez Perce lands, including Joseph's Wallowa Valley. An influx of new settlers caused by a gold rush led the government to call a second council in 1863. Government commissioners asked the Nez Perce to accept a new, much smaller reservation of 780,000 acres (3,200 km²) centered around the village of Lapwai in Idaho, and excluding the Wallowa Valley. In exchange, they were promised financial rewards and schools and a hospital for the reservation. Head Chief Lawyer and one of his allied chiefs signed the treaty on behalf of the Nez Perce Nation, but Joseph the Elder and several other chiefs were opposed to selling their lands, and did not sign. An 1889 photograph of Chief Joseph speaking to ethnologist Alice Cunningham Fletcher and her interpreter James Stuart. My son, my body is returning to my mother earth, and my spirit is going very soon to see the Great Spirit Chief. When I am gone, think of your country. You are the chief of these people. They look to you to guide them. Always remember that your father never sold his country. You must stop your ears whenever you are asked to sign a treaty selling your home. A few years more, and white men will be all around you. They have their eyes on this land. My son, never forget my dying words. This country holds your father's body. Never sell the bones of your father and your mother. Chief Joseph commented, "I clasped my father's hand and promised to do as he asked. A man who would not defend his father's grave is worse than a wild animal." The non-treaty Nez Perce suffered many injustices at the hands of settlers and prospectors, but out of fear of reprisal from the militarily superior Americans, Joseph never allowed any violence against them, instead making many concessions to them in hopes of securing peace. He was never bitter at the treaty Nez Perce nor at the settlers encroaching upon his peoples' lands, so long as peace could be ensured. In 1873, Chief Joseph negotiated with the federal government to ensure his people could stay on their land in the Wallowa Valley. But in 1877, the government reversed its policy, and Army General Oliver Howard threatened to attack if the Wallowa band did not relocate to the Idaho Reservation with the other Nez Perce. Chief Joseph reluctantly agreed. Before the outbreak of hostilities, General Howard held a council to try to convince Joseph and his people to relocate. Joseph finished his address to the General, which focused on human equality, by expressing his "[disbelief that] the Great Spirit Chief gave one kind of men the right to tell another kind of men what they must do." Howard reacted angrily, interpreting the statement as a challenge to his authority. When Chief Too-hul-hul-sote protested, he was jailed for five days. The day following the council, Joseph, White Bird, and Looking Glass all accompanied General Howard to look at different areas. Howard offered them a plot of land that was inhabited by Whites and Indians, promising to clear them out. Joseph and his chieftains refused, adhering to their tribal tradition of not taking what did not belong to them. Returning home, Joseph called a council among his people. At the council, he spoke on behalf of peace, preferring to abandon his father's grave over war. Too-hul-hul-sote, insulted by his incarceration, advocated war. The Wallowa band began making preparations for the long journey, meeting first with other bands at Rocky Canyon. At this council too, many leaders urged war, while Joseph argued in favor of peace. While the council was underway, a young man whose father had been killed rode up and announced that he and several other young men had already killed four white men, an act sure to initiate war. Still hoping to avoid further bloodshed, Joseph and other Nez Perce chiefs began leading his people north toward Canada. With 2000 U.S. soldiers in pursuit, Joseph and other Nez Perce chiefs led 800 Nez Perce toward freedom at the Canadian border. For over three months, the Nez Perce outmaneuvered and battled their pursuers traveling 1,700 miles (2,740 km) across Oregon, Washington, Idaho, Wyoming, and Montana. The popular legend deflated, however, when the original pencil draft of the report was revealed to show the handwriting of the later poet and lawyer Lieutenant Charles Erskine Scott Wood, who claimed to have taken down the great chief's words on the spot. In the margin it read, "Here insert Joseph's reply to the demand for surrender." Although Joseph was not technically a warchief, and probably did not command the retreat, many of the chiefs who did had already died. His speech brought attention, and therefore credit, his way. He earned the praise of General William Tecumseh Sherman, and became known in the press as "the Red Napoleon." Joseph's fame did him little good. By the time Joseph surrendered, more than 200 of his followers had died. His plight, however, did not end. Although he had negotiated a safe return home for his people, they were instead taken to eastern Kansas and then to a reservation in the Indian Territory (now Oklahoma) where many of them died of epidemic diseases. In 1879, Chief Joseph went to Washington, D.C. to meet with President Rutherford B. Hayes and plead the case of his people. 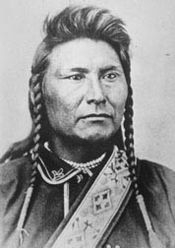 Finally, in 1885, Chief Joseph and his followers were allowed to return to the Pacific Northwest, although many, including Chief Joseph, were taken to the Colville Indian Reservation, in Washington state, far from both the rest of their people in Idaho and their homeland in the Wallowa Valley. In general, however, the relocated Nez Perce made few enemies in their new home, and even kept friendly relations with their white neighbors. In his last years, Joseph spoke eloquently against the injustice of United States policy toward his people and held out the hope that America's promise of freedom and equality might one day be fulfilled for Native Americans as well. An indomitable voice of conscience for the West, he died in 1904, still in exile from his homeland, according to his doctor "of a broken heart." Why I got lost once, an' I came right on [Chief Joseph's] camp before I knowed it … 't was night, 'n' I was kind o' creepin' along cautious, an' the first thing I knew there was an Injun had me on each side, an' they jest marched me up to Jo's tent, to know what they should do with me … Well; 'n' they gave me all I could eat, 'n' a guide to show me my way, next day, 'n' I could n't make Jo nor any of 'em take one cent. I had a kind o' comforter o' red yarn, I wore round my neck; an' at last I got Jo to take that, jest as a kind o' momento. The Chief Joseph band of Nez Perce Indians, who still live on the Colville Reservation, bear his name in tribute to their prestigious leader. Chief Joseph died in September of 1904, and was buried in Nespelem, Washington, the site where many of his tribe's members still live. Chief Joseph was portrayed in a few series television episodes and feature films. Notable among the latter is I Will Fight No More Forever, a 1975 historical drama starring Ned Romero. Folksinger/songwriter Fred Small's song, "Heart of the Appaloosa" tells of the struggle of the Nez Perce and Chief Joseph during their flight from the cavalry. The song portrays the tribe's relationship with the Appaloosa, a breed they had bred, as integral to their success in eluding the cavalry, and claims that the general who finally figured this out ordered his man to "kill the Appaloosa wherever it be found." According to the song, the death of so many Appaloosa was the blow that forced the tribe to surrender. Chief Joseph is featured as an anamatronic actor in the Epcot attraction "The American Adventure" at Walt Disney World in Orlando, Florida. Chief Joseph's speech provides the subject matter and is quoted in reggae/punk outfit State Radio's song, "Fight No More"
The words of Chief Joseph are spoken at the beginning of the song, "Words of Fire, Deeds of Blood" by Robbie Robertson. Chief Joseph did what he believed was best for his people at all costs. He wished to retain the land of his ancestors, while also hoping to avoid warfare with encroaching white settlers. The situation only came to bloodshed when making concessions was no longer a viable option. He became a mythical figure in the United States, as people attempted to seek out a Native American folk hero. Until his death, he would put this image of himself to use in an attempt to gain greater privileges for his beloved followers, dedicating a great deal of his time and effort to promoting racial equality and petitioning for land rights. ↑ James Morrow Walsh, Walsh Papers (Winnipeg, Manitoba: Public Archives, No Date), MG6. ↑ Helen Hunt Jackson, Glimpses of California and the Missions (Boston: Little, Brown, & company, 1923). Brown, Mark H. The Flight of the Nez Perce. Lincoln: University of Nebraska Press, 1982. Jackson, Helen Hunt. Glimpses of California and the missions. Boston: Little, Brown, & company, 1923. Joseph, Nez Perce Chief. "An Indian View of Affairs." North American Review 128 (April 1879): 412-433. Walsh, James Morrow. Walsh Papers. Manitoba, Winnipeg: Public Archives, No Date. This page was last modified on 11 February 2017, at 15:45.